I have been enjoying making rice pudding ever since I discovered it not too long ago. While the local strawberries were in season I knew that I would have to try a strawberry rice pudding. I was thinking about several different ways of making a strawberry rice pudding and decided to go with a simple plain white rice pudding with large pieces of fresh strawberries. 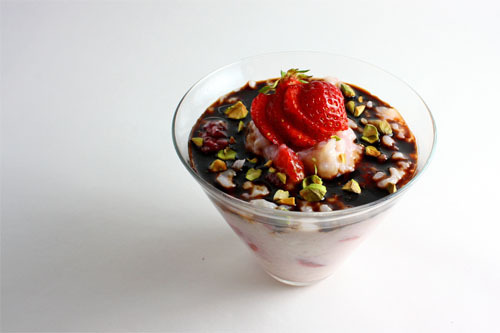 Balsamic vinegar goes really well with strawberries and I thought that serving the strawberry rice pudding with a balsamic syrup on top would be nice. I also sprinkled some chopped pistachios on top to add some colour and a contrasting texture. Rice pudding is pretty easy to make and if your rice maker has a porridge setting it is even easier. The strawberry rice pudding with balsamic syrup was really good. The slightly tart balsamic syrup was a perfect compliment to the sweet strawberry pudding. I prefer to chill rice pudding in the fridge before eating it but sometimes I just can’t wait; luckily it is good warm. Bring the milk, rice, sugar and vanilla extract to a boil in a sauce pan. Reduce the heat and simmer until the milk is mostly absorbed, about 25-35 minutes, stirring occasionally. Simmer the balsamic vinegar and honey in a small sauce pan to reduce to a syrup. Mix the strawberries into the rice and drizzle the balsamic syrup on top followed by the chopped pistachios. Take a look at the Sugar High Fridays roundup at Food Blogga. As a child Mama would make rice pudding with raisins, what a unique twist to an old classic. I love the combination of classic comfort food (rice pudding) with something more modern (balsamic sauce). This will be a lovely addition to SHF. Thanks! I love rice puddings! The addition of strawberries and balsamic syrup just makes me love it more. stunning picture. rice pudding is my husbands absolute favorite. Mmm, this sounds so good! I really like the combo of strawberries and good quality balsamic. I really like that picture today Kevin. New twist on the rice pudding with the balsamic. I’ve been seeing rice pudding recipes for a while now but I’ve never gotten round to it! I guess I will have to give it a try sometime soon! Btw, I love this photo. It’s so clean, so simple but so stunning! I love rice pudding! I can’t wait for fall, when I love it warm with plenty of cinnamon….but I’m going to try it with some of the 20 quarts of strawberries I froze, too! Balsamic syrup is like liquid gold, eh? Who would’ve thought the humble rice pudding could turn in to sophisticated dessert? This is a refreshing take on a dessert that can be very boring at times. It looks fantastic. Hey i love strawberries with balsamic so i’m sure the rice pudding adds an extra dimension of deliciousness! Nice Job. Very classy entry. I love your fanned strawberry. Very creative, as always. Even when I’m not hungry, I suddenly want to eat after visiting your blog. Yum! I’ve only had rice pudding “plain”; your twist on it sounds good! I just love rice pudding! Great combo with the strawberries and balsamic syrup! I love rice pudding~ this looks FABULOUS! that looks absolutely gorgeous Kevin! That sounds interesting! I bet this combination of ingredients tastes also great! I love balsamic vinegar in desserts. Not long ago, I made a chocolate sauce with this vinegar… Heavenly! nice combo and lovely colour! mmm. this looks great! i have only had rice pudding with cinnamon, but this is a really great twist on that. so pretty! I adore rice pudding, but never had it strawberry kind. The strawberries are finishing here allready, that’s sad. I can just imagine it tasting really good, specially with that syrup! Looks like something exotic I will find only in a posh restaurant! Kevin that picture is fantastic! Such a yummy looking dessert. I saw this photo on Fotogawker and it just said: “Kevin!!! !” Fantastic. I would never have added the balsamic syrup, nice touch! Mmmm, strawberries with balsamic AND rice pudding, wow! Looks fantastic Kevin! Sounds simple & looks so delicious. I had rice pudding for the first time not too long ago and was surprised at how much I liked it. I’m eager to try this recipe as I have some strawberries nearing their end of life! I’m certain it tasted great, but I am especially impressed with the pretty presentation! I love the green pistachios on top, nice touch. i still haven’t tried the strawberry-balsamic combination, but apparently it’s the go-to pairing these days. this looks lovely, and i think the pistachios are a terrific touch. Balsamic and Strawberries are all the rage these days.! Never made rice pudding before as I think it looked to bland for me – that is until now. This loolk amazing and I will have to step up and give it a try. This sounds really good ~ I am going to have to try this before those strawberries are gone for the year! I love rice pudding! When I was a kid, whenever they served rice pudding at school for dessert, they always put in a dollop of strawberry jam, and I would stir it in until the rice turned pink. The balsamic syrup is an interesting addition, sounds like a good combo. So pretty! How’d you get such a perfect white background for the photo? This looks soooo fantastic! Almost too pretty to eat!! This is such a keeper. It combines all the right flavors. Love the colors Kev. That’s a beautiful summer treat right there… who needs ice cream? Vicarious Foodie: I used a large sheet of white construction paper suspended above and dropped down and under the bowl to get the white background. You know I have yet to ever have rice pudding. But I think if I do this will be the first kind I try. Yum. I really can’t get enough of all things balsamic, especially when paired with sweets, this looks great! Lovely rice pudding Kevin. I will have to try it! We have a rice pudding debate in our house. I like my rice pudding hot and Graham likes his cold. I fear we will never agree! Looks good!!! yum yum. I love the glass!! where did you get it? mycookinghut: If I recall correctly, I believe that I got the glass at Pier One. I’m not a huge fan of rice pudding, but this grown-up version tempts even me! Lovely pic too. This looks amazing. What a great entry for SHF! I bet the creaminess of the rice is so lovely with stronger taste of the balsamic syrup. I haven’t taste any rice pudding before. But your version of strawberries with balsamic vinegar sounds exotic. I never heard of this combo in Asia. I might just try this out. this sounds great, for exactly the reason you said: i love rice pudding, but it tends to be cloyingly sweet, and since balsamic and strawberries are both a bit sour, how can you go wrong?